Kalli Balduin has developed a rating book (and method) for Go teachers, who work with many children. In a colorful booklet they are listed with their actual rating. 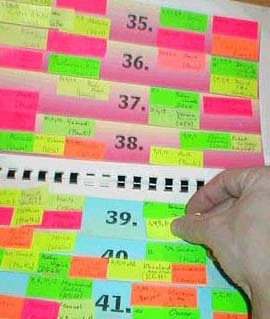 Their names are written on post-it stickers, which can easily be removed, while they go up and down the list. The children start at 50th kyu. With every won game they move up one kyu. If they lose a game, they will stay at their current rating place. From the 30th kyu (and up), every kyu is divided in nine steps, which implies that they have to win nine games to improve to the next kyu. If they lose a game, they will go down one single step, but not below the lowest place of their current kyu. When a child promotes to the next kyu, it is a very suitable moment to "reward" him (her) with a private Go lesson in a serious game against the teacher. 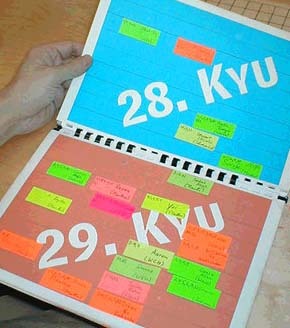 The rating book helps to easily monitor the activity and progress of many children at the same time. The children like this list very much, too, because they can easily see their progress (and that of their friends). It also helps to determine handicap between them. Other advantages: The teacher doesn't need to waste too much time on rating calculations or on database maintainance. The rating book can be carried everywhere. It can always be updated immediately. As of January 2004 there are more than 400 children in Kalli Balduin's Rating Book. He received the Iwamoto Award? for his idea. He can be contacted via the Berlin Go Club.